Younger consumers are viewing products and services in different ways to previous generations. Brands' innovation efforts need to recognise that millennials want to "live large and carry little", says J Walker Smith, executive chairman, Kantar Futures. In an interview in Campaign earlier this year, Johnson & Johnson chief marketing officer for innovation Alison Lewis said: "I believe in breakthrough innovation. We innovate to solve problems, which then allows us to push ourselves… Our products are getting outside of the bottle, the jar, the pill, to bring much more dynamic solutions to the marketplace." Lewis made it clear that a focus on brands and products is no longer enough for the global healthcare and consumer products giant – it’s now looking at processes and business models as well. J&J, like many brand owners around the world, has realised that success today requires more than incremental improvements to products. Companies must make bold bets if they are to prosper. Recent transformative innovations from J&J have seen the company introduce various ‘bold step’ tech-based ideas – including its "Bedtime Sleep" app, which provides expert advice for parents on bedtime routine and the Neutrogena Light Therapy Acne Mask, a revolutionary mass market LED-based light therapy product aimed at acne sufferers. There’s a similar thinking behind Unilever’s purchase of Dollar Shave Club for an estimated $1bn in 2016. The razor market was another sector where big brands were locked in a war of attrition through incremental innovation. Nobody could deliver the product-based knockout punch. 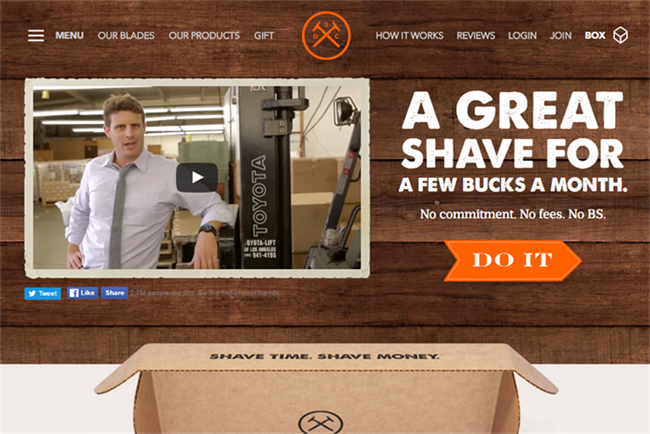 Dollar Shave Club offered a completely new way for Unilever to compete by disrupting the market, based around a service-based proposition rather than a product-centric one. These are not the sort of new products consumer products giants like Johnson & Johnson and Unilever would traditionally have launched. But the environment that brands are now operating in has changed so radically in the past decade that only this kind of innovation will work. That’s because we have seen a fundamental resetting of consumer values and lifestyle priorities. This is especially true of younger consumers (millennials who came of age around the year 2000 and centennials born around the year 2000), but older consumers are also affected. People no longer consume products and services in the way that they did. This can be summed up in four words: Live large. Carry little. That is to say, consumers want to live as big of a life as ever, but they want to do so without all of the baggage that has come with it in the past. Conspicuous consumption is out. Savvy consumption is in. Much of this is about a smaller footprint, of course. Consumers want to share, not hoard; they want to save the planet, not just money; they want to recycle and upcycle, not throw away. But just as much of this is about a hassle-free life. Brands must now adapt to a world in which consumers are not seeking validation through filling their cupboards, but through filling their lives. There are a range of factors behind this sea-change in consumer attitudes, including the current economic climate, which has made consumers poorer; new technology, which has made them smarter and savvier, not to mention enabling them to avoid or block much advertising and marketing; and a whole range of capacity constraints. and, perhaps most of interest to marketers, consumers’ ability to process the huge number of marketing messages they now see every day. To focus on this last point: increasingly, consumers are having difficulty understanding what differentiates leading brands from each other. This growing lack of clarity is not really surprising. The aggregate number of ads tracked by Kantar Media is up 120 percent since 2008, while time spent with all media, as tracked by eMarketer, is up only 17.5 percent. Marketers are outstripping the capacity of consumers to keep up by nearly seven-fold. What’s bad for big, old fashioned companies is good for small, agile ones, of course. Competition thrives on disruption and today every aspect of the global marketplace is in turmoil, all at once. This has created huge opportunities for completely new companies and brands that have moved in to disrupt traditional competitors – or for existing companies agile enough to rethink, recreate and re-present themselves. It’s all about decoupling the product from experiences and then selling experiences. It’s about facilitating relationships between people rather than only focusing on engagement with the brand. It’s about learning to live with the algorithms that consumers are using more and more to advise and drive decision-making – the same algorithms, by the way, that disruptors like Amazon are using to change the rules. If Amazon has its way, brands won't mean anything in an algorithm-driven world – Amazon will own the relationship with future consumers. As its reach is growing, brands must figure out how to deliver new meaning. The key will be inspiration. That’s what Alison Lewis is talking about when she refers to breakthroughs. That’s what consumer aspirations and new marketplace conditions will require. And that’s what brands must do to measure up to the future of consumption.